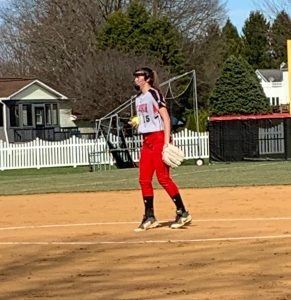 HYDE — Shutdown pitching by Emma Hipps and some offensive fireworks with six extra base hits got the Clearfield Area High School softball back in the win column Wednesday. The Lady Bison put back-to-back close Mountain League losses behind them and cruised to an 11-1 Mercy Rule victory over 1-5 Huntingdon at the Bison Sports Complex. Hipps silenced the Lady Bearcat bats, allowing only four hits, to get the Lady Bison back to .500 at 3-3, all of the decisions on her record. The hard-throwing freshman right-hander dominated with 15 strikeouts, her fourth start with double-digit whiffs. She issued two walks and hit one batter. Two-run home runs by Hipps and Casey English highlighted the Lady Bison’s 14-hit attack against two Lady Bearcat hurlers. Lauren Ressler continued her torrid hitting with a double and two singles, Morgan Cheek also had three hits and Hipps, English and Alexis Bumbarger chimed in with two apiece. Lauryn Smith’s leadoff double to right center and two wild pitches produced the lone Lady Bearcat run, but the Lady Bison countered right away. After Kylee Hertlein received a walk and stole second base, Hipps and Olivia Bender ripped back-to-back RBI doubles. Cheek’s infield single made it 3-1, and she drove in Clearfield’s next two runs in the third frame. She looped a single to short center field that scored Bender, aboard on a fielder’s choice, and Ressler, who had lined a double to left center. The Lady Bison expanded their lead to 10-1 in the fourth, thanks to a pair of infield miscues by the Lady Bearcats. Hipps cranked her third home run of the season over the left field fence after the first misplay. Following the second error, Ressler singled to right to plate Bender and then trotted around the sacks when English whacked her first varsity homer to left center. English also came through with the walk-off hit in the sixth inning, Bender touching the plate for the fourth time after drawing a walk and moving to third on singles by Ressler and Cheek. Ressler, Cheek and English combined for eight hits and seven RBIs as the 5-6-7 batters. The Lady Bison are booked for their third game in as many days Thursday with Bradford paying a visit for a 4:30 p.m. start. Mountain League standings –— Philipsburg-Osceola 5-0, Bald Eagle Area 4-1, Tyrone 3-2, Central 3-2, Clearfield 2-3, Penns Valley 2-3, Bellefonte 1-4, Huntingdon 0-5. Lauryn Smith 3b 3110, Gabby Brown lf 2000, Destiny Biemesderfer ss 3010, Riley Confer c 3000, Alyssa Yingling 1b 3010, Hanna O’Donnell-Scalia 0000, Lauren Heintzelman cf 3010, Hayleigh Scott rf-dp 2000, Maddie Burkey 2b 1000, Haylee Riley 2b 1000, Chrislyn Patrick dp-rf 2000, Amanda Norris p (flex) 0000, Sophia Denardi p (flex) 0000. TOTALS: 23 1 4 0. Karly Rumsky cf 4100, Kylee Hertlein 2b 3100, Emma Hipps p 3223, Olivia Bender c 3411, Lauren Ressler 1b 4231, Morgan Cheek lf 4033, Casey English dp 4123, Alexis Bumbarger ss 3020, Alexis Benton rf 2010, Sam Wisor ph 1000, Alyssa Twigg 3b (flex) 0000. TOTALS: 31 11 14 11. E – Biemesderfer, Burkey; Twigg. LOB – Huntingdon 7; Clearfield 8. 2B – Smith; Hipps, Bender, Ressler, Bumbarger. HR – Hipps (3), English (1). SB – Hertlein. Huntingdon – Norris 3-2/3 IP, 10 H, 10 R, 6 ER, 2 BB, 0 K; Denardi 1-1/3 IP, 4 H, 1 R, 1 ER, 1 BB, 0 K.
Clearfield – Hipps 6 IP, 4 H, 1 R, 1 ER, 2 BB, 15 K.
HB – Hipps 1 (Scott). WP – Norris 1; Hipps 3. W – Hipps (3-3). L – Norris. Umpires – Gary Kost (plate) and Jay Siegel (bases).